North Carolina faces a serious environmental disaster should Hurricane Florence bring the three feet of rain currently forecast. 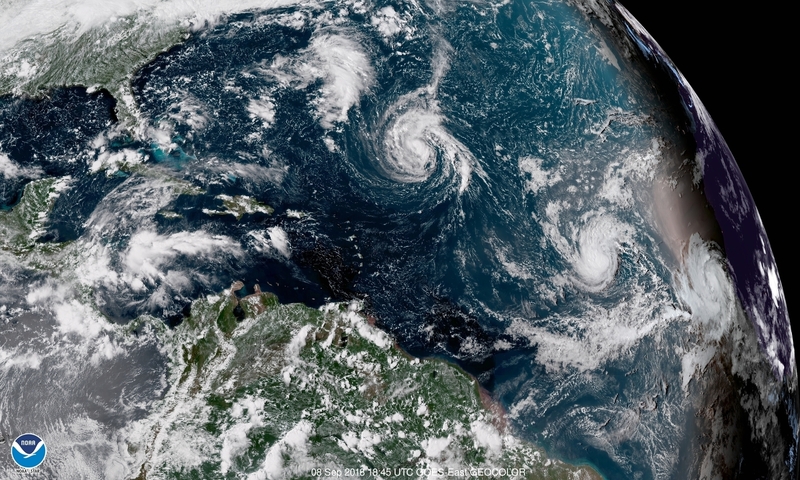 Forecasters are predicting Florence will drop three feet of rain—enough to completely flood the eastern part of the state. Unfortunately for residents, eastern North Carolina is home to many industrial pig farms, with their attendant manure pools. Should the pig farms flood—and there is every reason to believe they will—a toxic stew of pig feces mixed with other industrial chemicals will wash over the countryside and contaminate the drinking water. North Carolina is home to about 2,100 industrial pig farms, housing some nine million pigs, according to NBC. Those pigs produce millions of gallons of waste, which accumulates, untreated, in enormous waste ponds. Three feet of rain could cause these waste ponds to overflow, drowning the eastern part of the state in a foul-smelling and very poisonous slurry. Included in the mix will be gasoline and diesel fuel, fertilizers, pesticides, and any other chemicals used on farms. On top of that, there are some toxic waste dumps in the area. Duke Energy, the state electric utility, has more than two dozen massive storage pits holding coal ash, the toxic residue from their power plants. Coal ash contains heavy metals like mercury, arsenic, and lead. All of these toxic substances could be swept across the countryside by the pig-sewage stew, poisoning everything it touches. While no one can predict how much rain Florence will actually drop, nor the exact amount of flooding that might ensue, North Carolinians know that all these worries about a toxic sewage tsunami are well-founded—because they have seen it happen before. When Hurricane Floyd hit North Carolina it was only a Category Two storm. It still dumped about two feet of rain on the coastal regions of the state. Flooding killed dozens of people and submerged entire towns. 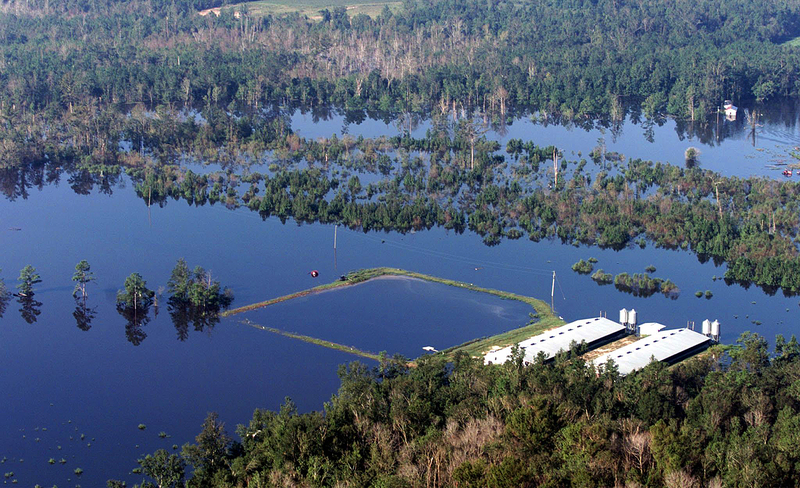 When the floodwaters hit the hog pens, they churned up a poisonous wave of waste and chemicals which killed fish and drowned livestock, whose rotting bodies added to the toxicity of the spreading stew. Not only did the state have to clean up being flooded by poison-laced pig waste—taxpayers also ended up buying out 43 farms which were destroyed by the waste-flood. Hurricane Floyd, which caused so much damage and cost so much money, was a Category Two storm when it hit land. Hurricane Florence is projected to be a Category Four. Pig farmers are doing what they can to minimize the risks. Some farms are trying to move livestock to higher ground where possible, and other farms have been pumping waste out of the waste ponds. “Our farmers and others in the pork industry are working together to take precautions that will protect our farms, our animals and our environment,” Pork Council President Brandon Warren told NBC. North Carolina’s Own Fukushima Disaster? 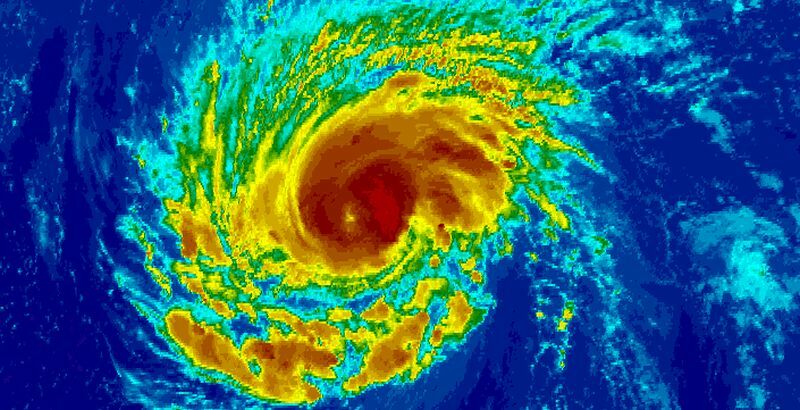 Hurricane Florence is bearing down on one of North Carolina’s six nuclear power plants. The Brunswick Nuclear plant has two reactors—one of which has the same design as those used at Japan’s Fukushima power plant, which melted down after being hit by earthquakes and floods. According to the News-Observer, the Fukushima plant’s back-up generators flooded, which stopped the flow of cooling water to the reactor vessel. Heat from the reactors caused hydrogen explosions which ruptured the reactor vessels, releasing radioactivity. After the still unresolved disaster at Fukushima, U.S. regulators demanded that power plant operators upgrade their plants to be better able to withstand earthquakes and flooding. Duke Energy announced that it had prepared backup generators and extra emergency pumps to evacuate floodwater before it could become an issue and assured the public that the plants were in no way vulnerable. The Brunswick nuclear plant has survived near-misses by several hurricanes since it was built in the 70s. Hurricane Andrew, a Category 5 storm, directly hit Florida’s Turkey Point nuclear plant in 1992. The reactor vessels were never compromised and the cooling pumps kept running throughout the storm.